In these hard times, when the most vulnerable are scapegoated and capitalism is unable to face up to its own failings, it is important not only to remind ourselves why a civilised society needs a safety net but also that if we looked to alternatives to the iniquitous system of capital in the first instance, that safety net would not be needed. 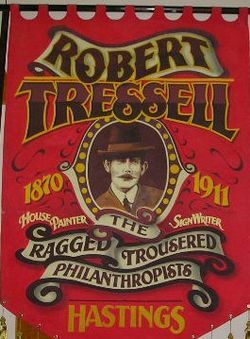 The Ragged Trousered Philanthropists, a novel by the Irishman Robert Noonan under the pen name Robert Tressell, is set in 1906 in a thinly disguised Hastings and concerns a group of painters and decorators. The Edwardian era is often recalled as a golden age of endless carefree summers where differences between rich and poor did not matter. Tressell, however, describes the lives of working men and the poverty, exploitation and destitution they and their families face. It is a novel of humour, warmth and tragedy. The philanthropists of the title are the colleagues of the novel’s hero, the socialist Owen, whom he believes give their skill and labour to their boss without just or deserving reward. The constant divide and rule used by the employers to drive down wages, exploits the fact that in a world before the welfare state, being unable to work brought the fear of the workhouse into sharp relief. The novel charts Owen’s attempts to convince his workmates that socialism is the only solution to their many privations: in a chapter called ‘The Great Money Trick’, he hilariously demonstrates how their labour creates surplus value that is appropriated and accumulated by the bosses as personal wealth. Many of Owen’s experiences were clearly Tressell’s own. Having left his native Dublin, he arrived in England, via South Africa, and worked as a painter and decorator in Hastings. Hastings has long had a place in its heart for Tressell: The Robert Tressell Society is based in St. Leonards and holds an annual festival commemorating his life and work; the Robert Tressell Collection is held at the Hastings Museum and Art Gallery; and the Hastings Chronicle website has a very detailed record of all the Hastings locations used in the novel. A single parent of a daughter, fear of destitution because of his failing health spurred Tressell on to write of his experiences in Hastings. Having completed the manuscript in 1910, he failed to find a publisher and decided to emigrate to Canada the following year; but he only got as far as Liverpool where he died of tuberculosis in a workhouse hospital and was buried in a pauper’s grave. The novel was published posthumously in 1914 in a much abridged version and, as interest in socialism steadily grew, so did the reputation of The Ragged Trousered Philanthropists. An unabridged version was eventually published and, when Labour won a landslide victory in the 1945 general election, some influence was credited to copies of the book being widely passed around amongst returning troops. As the 20th century wore on, the novel’s reputation as an accessible and seminal text of the left increased. As a teenager forming my political views in the late 1970s, a work colleague gave me a battered copy to read; within a week my socialism was cemented. I still have that copy and I have re-read it several times since then, most recently last year when I taught it to A level students. It is a salutary lesson in why we created the welfare state and - in a week where politicians in denial over the real cause of the economic crisis use the oxymoronic phrase “responsible capitalism” - a reminder that the current system is pernicious and immoral and should be dismantled to make way for a fairer way of organising society. It would be a good idea if some of those currently in control of the Labour Party were to re-read The Ragged Trousered Philanthropists (that’s if these career politicians have read it in the first place); they might find something they have lost: socialism.